Mobiles sporting the latest release of the Windows Mobile operating system are now available for sale worldwide. Microsoft is also formally launching its application store, known as Windows Marketplace for Mobile. While the service will launch with about 60 applications available in the UK, Microsoft's Alex Reeve said that number would soon rise sharply. Windows-run phones can also make use of the My Phone service, a synchronisation service managed "in the cloud". The new operating system and the application store were first announced in February, when a "beta" testing version of the My Phone service also launched. Tuesday's announcement sees a full integration of handsets incorporating the new OS with access to the store and back-up service. Microsoft has partnered with major network operators T-Mobile, O2, Vodafone and Orange in the UK, as well as with Carphone Warehouse and Phones4U to distribute handsets made by a wide range of manufacturers. The expansion - as well as the rebranding to "Windows phones" - are an effort to increase market share in the mobile handset world, where Windows currently holds about 9%. "I think one of the fundamental advantages that we have... is the amount of choice there is in terms of hardware choice and platforms, and that just keeps going and going," said Alex Reeve, Microsoft's director of mobile business in the UK. The OS update - the first since March 2008 - is viewed as minor, as Microsoft is developing a more complete overhaul of the OS. The result of that, Windows Mobile 7, should be released in early 2010. Significant changes in the 6.5 release include a move away from the use of the stylus and toward more finger-friendly icons and buttons, and a push to see more "at a glance" from the lock screen and the main menus. 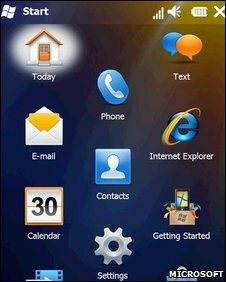 The operating system comes bundled with Internet Explorer Mobile 6. Speaking at the launch, Mr Reeve admitted that "this is an area where Microsoft probably hasn't kept up with the market as well as we should have in the past, but now with the new version, we're right there". It includes a significantly updated user interface and Flash Lite for viewing video and animation content. The My Phone service is also updated compared to the beta version. Users can both backup and manage their applications and multimedia content via the My Phone service, accessible also on a PC. The service offers 200MB of storage for free. Photos can be published from the My Phone site or directly from a Windows Phone to popular sites such as Facebook and Flickr. Security features offered for free include the ability to map the last place a phone was synchronised to the My Phone service. A further, paid "premium package" allows a suite of security features including the ability to locate a handset's current location, present an "if found" message to its screen, or lock it or erase its contents altogether. The premium service is at the time of launch only available in the US. The Windows Marketplace will launch with applications including Facebook and MySpace and a raft of popular game titles. It also offers a no-questions-asked return policy on the applications it sells. While the number of applications at the time of launch is just 60 in the UK (and about 250 worldwide), Mr Reeve said that there is a large backlog of applications that will soon be approved and become available. He added that Microsoft's heritage will drive further development of applications for Windows phones. "One of the great things for Microsoft is that the developer market is in our DNA; we've got a huge background working with developers, so when it comes to building applications for mobile we've got a great opportunity."